We regret that refunds cannot be given in any circumstances except the following: you cancel your place in writing 4 weeks before the first date you have booked, in which case we will give you a 50% refund. If you need to cancel after that date you may pass on your place to another. 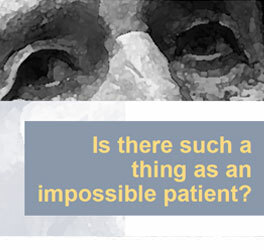 In this seminar series we are exploring the concept of the 'impossible patient', asking who might be considered unsuitable for therapy and why some therapy relationships fail. Our nine speakers, each highly experienced psychotherapists, will consider the dilemmas they have faced and ways that they have found to make sense of psychotherapeutic relationships that are particularly challenging. The aim of this series is thus to open up a space for considering why certain people may struggle so deeply with the therapy process. We will ask why traditionally some people have been considered unsuitable or even unworthy of psychotherapy such as psychotic, brain damaged or 'borderline' patients, who are rejected by the psychotherapy services or only accepted into treatment with reluctance. We will question if different views about who can or cannot benefit from a therapeutic relationship reflect different theories about the psychic structures or an objective truth about that person. Probably every practitioner has worked with people who seem unable to benefit from the relationship. What sense are we to make of those failures? Do we think they are the consequence of a poor therapeutic match or of the patient's incapacity to benefit? Is it possible to know at the assessment stage or will this emerge as the relationship progresses? The most challenging forensic, psychotic and dissociative cases are considered in the programme, as well as an exploration of psychological structures that threaten to rupture or derail the therapeutic journey and face the practitioner with their greatest challenges.